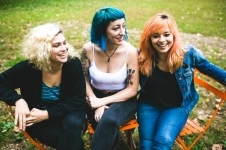 The follow up to Cayetana’s debut LP Nervous Like Me, which gained the band critical acclaim, a dedicated fan following, and tours with bands like The Menzingers, Against Me!, Waxahatchee and The Bouncing Souls in The US, Canada and Australia, New Kind of Normal retains the pop sensibility and candid songwriting of its predecessor yet exhibits a clear growth in sonic diversity. Although many of the songs were worked out at Koch’s barnyard studio in the Poconos, the band returned to Matt Schimelfenig at Philly’s Miner Street Studios to record the record. The collaboration resulted in a diverse output of expertly crafted, hooky pop songs like “Mesa” coupled with sparse, dark, and deeply emotional synth-laden tracks like “World.” Musically, the record captures the quiet moments of crushing vulnerability and the hardened highs of personal strength as expertly as Koch’s lyrical craft. 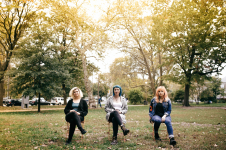 If Cayetana’s newest album had a tagline it would be “how to stop self-sabotaging and accept love.” Thematically, the Philadelphia indie rock three-piece - comprised of Augusta Koch, Allegra Anka and Kelly Olsen - has been exploring the delicate interplay of mental illness and wellness, since they began releasing music in 2014, but never so gracefully and poignantly as on New Kind of Normal. 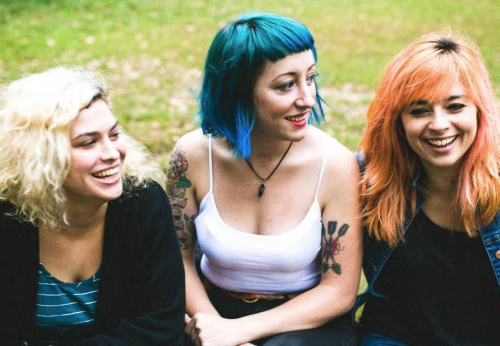 “The record is about mental health…struggling with that and settling into a new kind of normal where you can finally recognize your own your destructive behaviors and accept love into your life.” Cayetana explore the concept of normality when living with mental illness, that what you know as normal can be self-destructive, and that finding a new way of living, a new kind of normal, where self-care and self-respect are the norm is an often painful and lifelong process that can feel foreign and undeserving. New Kind of Normal, however, reminds us that self-love is merited and palpable and delivers us a soundtrack for finding it. Songs like “Certain for Miles,” embody the concept of the record beautifully. Koch sings, “When the world bears down on me will I laugh at it’s audacity and be able to comprehend? When the world bears down on me will I laugh at it’s audacity and be able to start again?” The answer, apparently, is yes and always has been. From the group’s inception Cayetana has exemplified the beauty and spirit of perseverance and DIY. They started as three friends who had barely been acquainted with their instruments and in just three years have become one of the most promising bands in indie music. They prove on New Kind of Normal that growth takes self-responsibility, accepting the help of others, and resilience proving that the risk is worth the writhing. Evidently, there is a new kind of normal not only in the mind but also in music and Cayetana is determined to help us find it.